For dough preparation, sift the flour with the salt into a deep bowl. Cut butter into small squares, add it to the flour, and then grind the mass so as to form small chips. Next, add soda in matsun (or yogurt), stir, and then pour it into the flour. Now it’s time to knead the dough: mix the ingredients with hands until you get soft dough, if it is liquid or too sticky, add some flour. It is not necessary to knead the dough for a long time, it just should be soft, gentle and does not stick to hands. Then divide the dough into three pieces, place in a plastic bag and put in refrigerator for 40 minutes. While the dough is resting, you can proceed to the preparation of the filling. Pour the flour in a deep bowl then add some vanilla. Grate the butter and add to flour, and then pour 1 cup of sugar to the mass. Then mix the mass with your hands to get buttery crumbs. Preheat the oven to 200 C. Remove the dough from the refrigerator and roll out each piece into a thin layer of 3-4 mm in thickness. Spread the filling on the surface of the dough and then gently roll it up. The roll should be cut into medium rhombs 2cm wide. Lay the tray with baking paper then grease with oil. Place gata on the tray, grease with egg yolk and put into the oven for 20-25 minutes. After the desired time, remove the gata from the oven and serve. 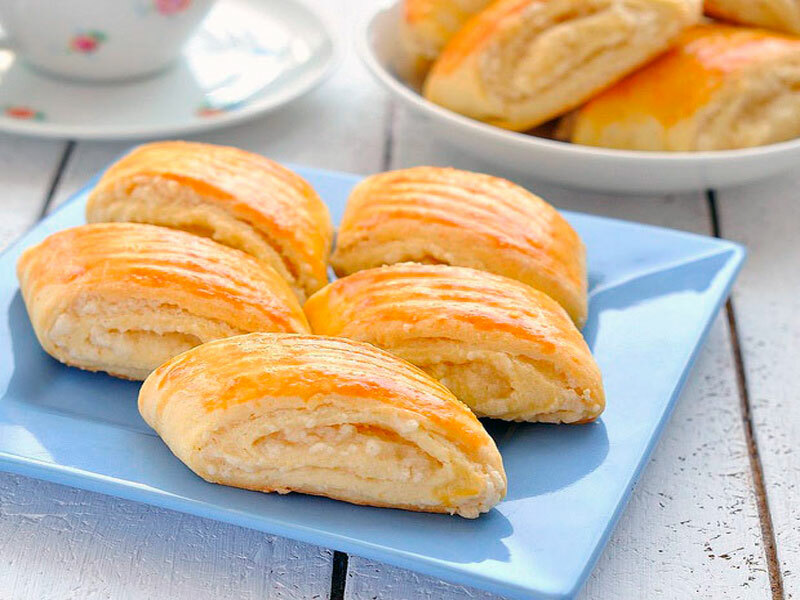 Enjoy your tea with this soft delicious dessert! If you’ve never tried walnut jam then be sure to try – it has an absolutely unique taste. Armenians have their own special recipe for the preparation of this delicacy – they add cinnamon, cloves and cardamon to the sugar syrup. It turns out very fragrant jam with a completely unique taste and aroma! To begin with unripe green walnuts should be cleaned from the shell, covered with cold water and left for 6 days. Do not forget to change the water every day for 3-4 times. After the desired time, the nuts should get strongly darken. At this time, it is already possible to drain the water and proceed to the next stage – the soaking in lime water.To do this fill the hydrated lime with 0.5 liters of water, stir and strain through cheesecloth. Place the nuts in the water and leave for one day. Then drain the water, wash the nuts and pierce them with a fork in several places. Dissolve the alum in water and bring to a boil. Then add nuts to boiling water and boil them for ten minutes, after which the water should be drained, and the nuts should be moved in cold water and leave it for an hour. Meanwhile, prepare sugar syrup. 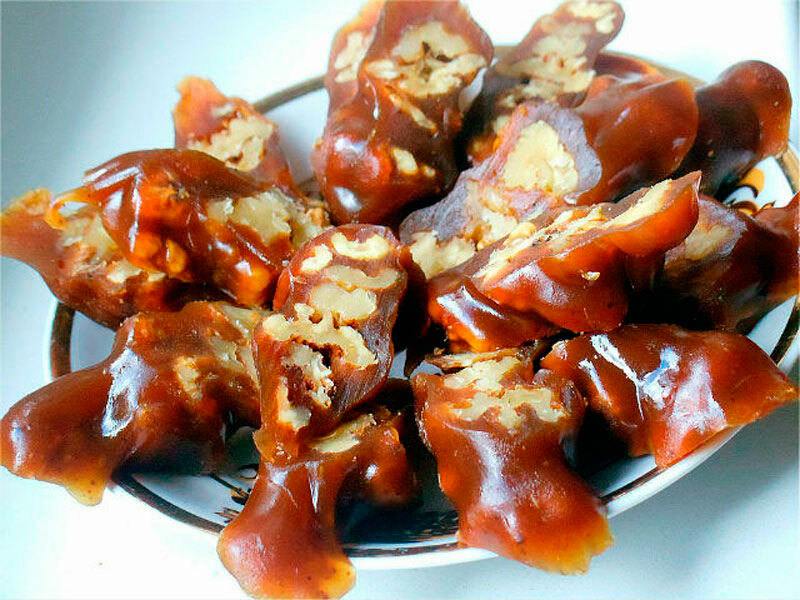 Put the nuts, in the syrup together with wrapped in a gauze bag. Allow the syrup to boil for 5 minutes and then remove the pan from the heat and leave for a day. Repeat this procedure, and then cook the jam for 2-3 hours. At the end remove the bag of spices. Jam is ready! First, you need to prepare a bunch of nuts. To do this, strung peeled walnuts halves on a thick thread, after which you need to make a loop, or attach the clip to the thread end. To the other end tie something heavy. Now it is time to pass to syrup cooking. Pour the flour in and, stirring constantly with a wooden spoon, add 0.5 liters of grape juice. When the mass gets smooth enough you need to pour the remaining juice and then put the pan on fire. Cook the mass, stirring constantly until it gets very thick. During the process add some sugar (to taste), cinnamon, cardamom, and cloves (which should be removed at the end). Remove the pan from the heat and begins to sink into the mass thread nuts. Dip your nut thread to the mass. It should be evenly distributed. Next, you need to dry sudjukh hanging each bunch of the loop. Usually, it will take about 10-12 days for sudjukh gets ready. Just check it with your fingers, if it is not sticky anymore then it is ready. Please note that in Armenia there are lots of excellent vineyards, and the Armenians are preparing sudjukh from the natural grape juice. If you do not have such an opportunity to use fresh juice, you can buy it in stores. But be careful to read the composition on the labels, because the juice should be completely natural. From nectar, filled with chemistry, you won’t get a good and right treat. 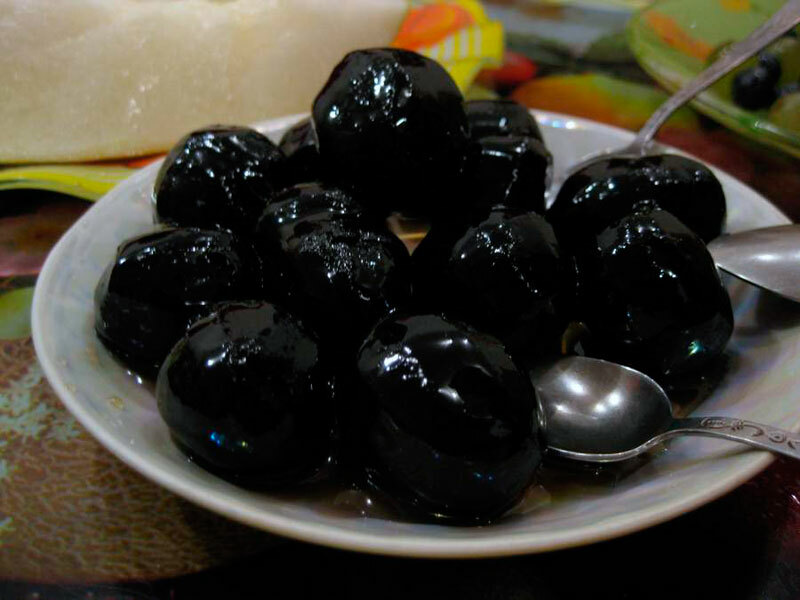 Take sour plums, rinse under running water, cut in halves and separate from bones. Put the plums in a saucepan and cover with water by 1/3 (sugar can be added if desired). It is necessary to bring the water with plum to a boil and cook over low heat until smooth. Strain the resulting compote through a sieve, and then whisk the mass in a blender until smooth. Then spread the mass on a large tray with. The layer should be of 4mm in thickness. Put the tray under the sun for drying. After 2 days the mass will harden and will be easily separated from the tray. Turn the plum lavash and then dry for another day. That’s is all. 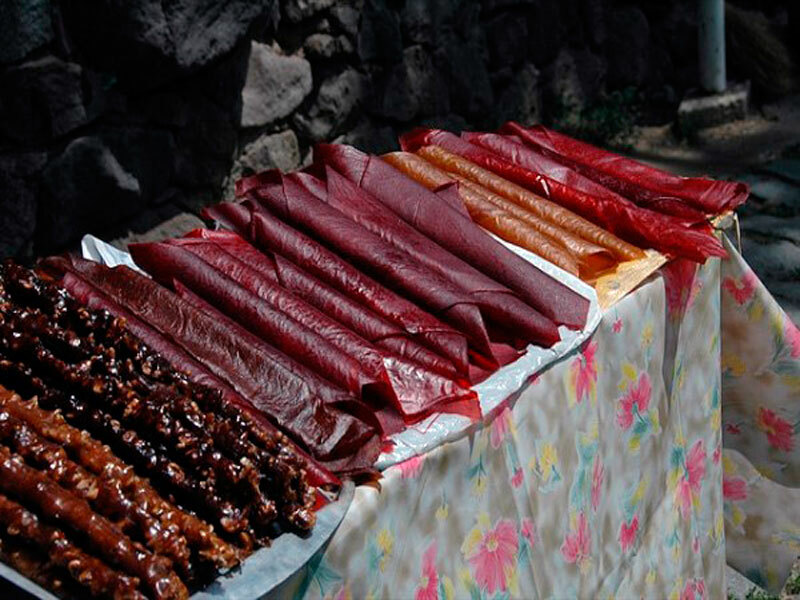 You can roll plum lavash and keep during one year.